Project Scope: Graphic design, layout. Project Description: A series of accordion-fold and gate-fold pamphlets that make up the physical play components of a transhuman roleplaying game. 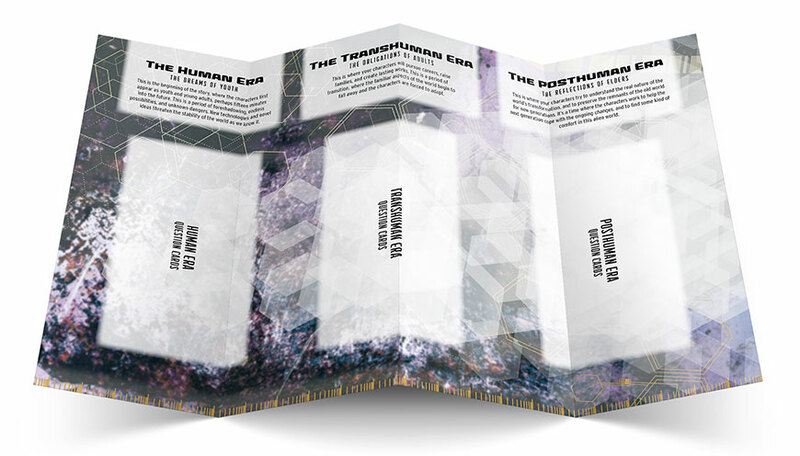 The Posthuman Pathways project consists of five legal-sized pamphlets that are used to play the game. The above graphic is pamphlet one: The Long Road. The obverse has an introduction to the game. This side has The Timeline, where players place cards and notes during the three eras of the game: human, transhuman, and posthuman. Unlike the other four gate-fold pamphlets, this is the only accordion-fold pamphlet in the game and will be laid flat when playing. On this project, the basic organization of information was detailed by the game designer. My first task was to take Jason’s document and come up with different type treatments for the project. After two rounds of treatments, we had a good black and white layout mock-up prepared. Subsequent milestones included creating a background for all five pamphlets and a timeline graphic. The basic backgrounds involved geometric patterns (and a pseudo-algorithmic scale “timeline”) over a heavily modified corroded metal graphic to give a sense of space. The timeline graphic repeated some of these geometric patterns in a rising motion, which begin to clean the background, expressing the unknown future and how it emerges in gameplay.